I'll be adding links, pictures and sound files, contact information, email and hiring information as the site develops. Let me know what else you'd like to see here. I’ve been a professional musician since I was a senior in high school, starting as a tubist in all sorts of ensembles both professionally and as a Music Education major in College. 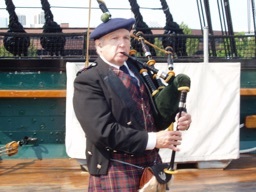 I started learning bagpipes in late 1979 and since the 1980s have been playing for weddings, funerals, other church services, graduations, parties and all sorts of events, including parades, as a solo piper. I accept engagements in the Greater Boston-South Shore area and am available for morning, daytime and evening events. I have an extensive repertoire and a wide variety of uniforms to fit any occasion. I’m proud of the positive feedback I receive from my clients. (see badges, below) If I make you happy, then I’m happy. Funeral, corporate function or other event?